Making vanilla extract at home is super easy and so much better than the stuff that you get at the store. Plus you can make so much more than the store bought extract. Normally store bought extract is around $4 for only 1 ounce of Vanilla Extract and is watered down. Sometimes they even put corn syrup it. Even if you find vanilla extract that is all natural or organic you spend $10 or more for a small amount as well. Homemade is 100% pure with only two ingredients in it. This has been sitting for a couple of months. Only need three items to make it. Two of them are easy to find at any grocery store, a mason jar and rum or any clear alcohol. Vanilla Beans can be found on Amazon. No need to spend a lot of money on Grade A vanilla beans those are for using in baking and using in to make vanilla ice cream or syrups. Grade B cost less to buy in bulk and are perfect for using in extracts or steeping in tea or coffee. 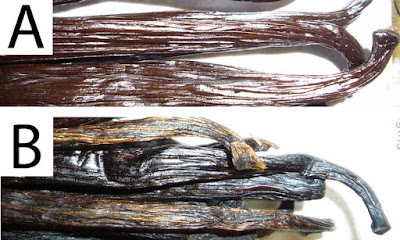 Grade A Vanilla Beans are thicker are almost black in color and even in size. Grade B are thinner, lighter dark brown color and not as even in size. 1/2 gallon of clear alcohol, I used rum. That will fill up to 2 mason jars. 1. Split all beans down the middle. Don't put too much pressure on the knife that may cut it too deep. 4.Seal tightly and place in a dark place for at least 6 to 8 weeks. The longer it sits the richer the flavor it will be when you use it. 6. Repeat the steps if you are making another jar of extract. Use name badges or stickers that can written on. Oh this is a great idea, I would never think to make my own! I'm so lazy, if I can buy it I tend to! I need to start making my own things from scratch more! The great thing about making it scratch made is that you can make a lot of extract that you could use multiple times and only two things in it. A mason jar full of extract last me dozens and dozens of baking recipes. Homemade vanilla is the best! My brother and his wife have been making for years and always share with me. Pretty sure they use vodka .. but you're right anything clear and boozy seems to do the trick! Yeah, any clear alcohol will work. I just prefer Rum because its smoother in flavor to me. I've only in the past year started to make my own homemade style things like olives and salami. This is amazing how you've detailed it all out. I might need to try this out! I started to make my own a couple of years ago because I baked a lot or had a lot of recipes that called for vanilla and the small bottles at the store just is only enough for one or two. I didn't realize it's so simple to make your own vanilla extract. I'm definitely going to try this one out! So easy and will get better the longer you let it set. 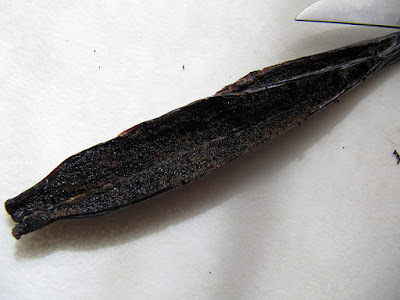 I never realized that it was so easy to make vanilla extract, I will be sure to bookmark this tutorial. I do love vanilla after all! It is super easy recipe and if your like me you like to bake a lot and use vanilla extract a lot. It is very easy to make and so much better than the store bought stuff even the organic vanilla extract.